Buying a phone doesn’t come cheap, that means you have to buy your Go Flip from network provider on discount and you didn’t buy Alcatel Go Flip unlocked. This also means your Go Flip will be sim locked and if you want to use any other network you’ll gonna have to sim unlock your Go Flip and thinking how to unlock my Alcatel Go Flip. Worry not anymore you are at the right place. Now you can get you Go Flip unlocked, you are not going to unlock Go Flip for free but very cheap and hassle free. so what are you waiting for. You can get your unlock app very easily which is the best way to get Alcatel Go Flip unlocked and can be obtain via your IMEI number. This method is official unlocking method comes from the database of network and follows official channels of unlocking. You can check your IMEI # by dialing *#06# . You can read more about how to find IMEI number of your phone here. All you have to do is right imei # and email address and in the time given above we will send you your Alcatel Go Flip unlock app solution on your e-mail address. After getting the confirmation of unlocking all you have to do is connect your Go Flip with wifi and open the device unlock app, in the app you need to select permanent unlocking and when the processing is finished you can get Go Flip factory unlocked. Our unlocking is risk free legit unlocking service as it will not even void your warranty or hurt your phone any way. You can unlock your phone by yourself without having any prior technical knowledge. You can read more with respect to risks involved in unlocking process here. 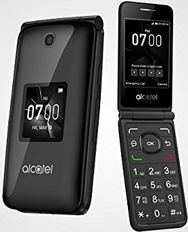 Advantages of getting Alcatel Go Flip sim unlocked are pretty cool as it saves you from excessive roaming expenses and cuts down the cost of calls and messages. You can read about benefits of unlocking your phone here. Why Unlock Alcatel Go Flip With LetsUnlockPhone? LetsUnlockPhone.com is the name of the brand associated with good reputation for satisfying customers by providing very friendly and respectful customer service. Above all, we provide 100% money back guaranty for our services. We are specialist when it comes to unlocking phones with unlock app whether your phone is from t-mobile, metropcs or EE(england). We don’t unlock security lock from t-mobile or MetroPCS phones, we only unlock sim network locks imposed by t-mobile or metropcs on you device. You can check specs of Go Flip here.